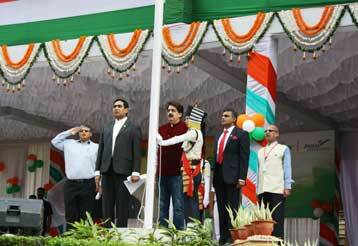 Angul: Jindal Steel and Power Ltd. (JSPL) celebrated the 72nd Independence Day on O.P. Jindal School campus situated at Jindal Nagar Township, Angul. On this occasion Mr. Rajeev Bhadauria, Group Head-HR unfurled the Tri-colour in presence of JSPL’s Angul Location Head and Executive Director (I/c) Mr. Atul Misra, HoDs of all the departments, hundreds of School Students and Employees with their family members and local villagers. In a message, read out by Mr. Atul Misra Chairman of JSPL Mr. Naveen Jindal highlighted achievements of JSPL and its commitment for contributing towards building the nation. “We are expecting to produce 4 Million Tonne of steel from Angul unit this financial year”, he said in the message. Addressing on this occasion Mr. Rajeev Bhadauria said “Innovative thoughts and actions are required for building a better future for India”. 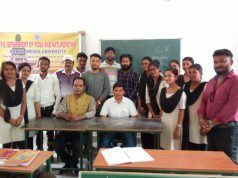 He advised the students and the employees to understand the changing work culture and current technological convergence for better prospective. Adding further Mr. Atul Misra, also elaborated the achievements of Angul unit in recent times. The School premises vibrated with a series of scintillating cultural presentation by students of O.P. Jindal School. More than 2000 people witnessed the grand celebration. Among the dignitaries, present on the occasion were Mrs. Anjali Misra, Jindal Mahila Samiti President; Mr Damodar Mittal, EVP-Iron Making; Mr. Alok Malhotra, VP-HR & ES; Brig. K.K. Chopra, Head-Admin; Mr. Ashish Pandey, AVP-Projects and others. JSPL Foundation also distributed 22300 sweets packets among children of 71 Schools and 79 Anganawadi Centres, situated across 19 Panchayats in Angul. Extending the 72nd Independence Day celebration, a Flag-hoisting program was also organized at the Shramik Vihar, where Thousands of workers participated. Flag was unfurled by Mr. Alok Malhotra, VP-HR & ES, in presence of Mr. Asish Ranjan Mohanty, DGM-HR and other officials of JSPL. Mr. Prashant Kumar Hota, EVP (CSR & Corporate Communication) hoisted the national flag in Independence Day celebration at JSPL’s Bhubaneswar Office.